• Use the extra time as buffer against potential risks. • Add scope. Add tasks you were hoping to include, but thought you wouldn't have the time. Build in a higher level of quality. Increase quantities being produced, if applica ble to your project. • Use the extra time to save money. For example, you might be able to be able to hire two designers instead of three and have those two designers carry out the design tasks in the longer available time. • Inform your manager or client that you can complete the project sooner than expected. Note If you change aspects of your schedule to bring in the finish date, the good news is that you probably won't adversely affect your project triangle. That is, adjusting your sched ule to meet your schedule requirements affects only the schedule side of the triangle. Costs and scope will probably stay as they are. 3 In the More Tables dialog box, click Constraint Dates and then click Apply. 1 Apply the Constraint Dates table to the Gantt Chart or other task sheet. 2 Click Project, Sort, Sort By. 3 In the Sort By dialog box, click Constraint Type and then click Sort. The tasks are sorted by constraint type, so you can see where you might have applied a Must Finish On or Start No Later Than constraint, for example. You can also see their associated dates. 2 Click Project, Filtered For, Critical. Only critical tasks are shown. When you want to see all tasks again, click Project, Filtered For, All Tasks. 2 Click the Constraint Type field, click the arrow, and then click the constraint you want in the list. Maybe you applied too many date constraints to too many tasks and you just want to start Task fresh. Select all tasks in the project, either by dragging them or by clicking the Select All box Information just above the row 1 heading in the upper-left corner of the table. On the Standard toolbar, click Task Information and then click the Advanced tab. In the Constraint Type box, click As Soon As Possible or As Late As Possible. The constraints on all selected tasks are changed. For more information about constraints, see "Scheduling Tasks to Achieve Specific Dates" on page 157. The second place to check your schedule for critical path-shortening opportunities is your task dependencies. A Gantt Chart is the best view for reviewing task dependencies and their impact on your schedule. View the Tracking Gantt or Detail Gantt so you can see critical tasks highlighted. Focusing on the task dependencies of critical tasks helps you bring in the finish date. 1 Click the successor task. 2 On the Standard toolbar, click Task Information and then click the Predecessors tab. 3 To change the link type, click in the Type field for the predecessor. 4 Click the arrow and then click the link type you want in the list. To remove the link entirely, click anywhere in the predecessor row, and press the Delete key. If you want to start over with your task dependency strategy, you can remove all links in the Unlink project. Be sure that this is really what you want to do because it can erase a lot of the Tasks work you've done in your project plan. Click the Select All box just above the row 1 heading in the upper-left corner of the table. On the Standard toolbar, click Unlink Tasks. All links on all tasks are removed. For more information about task dependencies, see "Establishing Task Dependencies" on page 149. After adjusting date constraints and task dependencies, if the finish date is still beyond your target, look at task durations. However, be aware that it's risky to be too optimistic about durations, especially if you used reliable methods such as expert judgment, past project information, industry metrics, or PERT analysis to calculate your current durations. 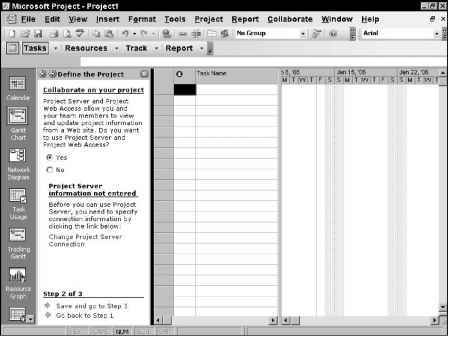 1 Display the Gantt Chart with the Entry table applied, or display another task sheet that includes the Duration field. 2 Click Project, Sort, Sort By. The Sort dialog box appears. 3 In the Sort By list, click Duration and then click Sort. The tasks are sorted by duration. 4 To see only the durations for critical tasks, click Project, Filtered For, Critical. When you want to see all tasks again, click Project, Filtered For, All Tasks. 5 To change a duration, simply type the new duration into the task's Duration field. The schedule is recalculated with the new duration. 6 To return to the original task order, click Project, Sort, By ID. For more information about duration, see "Setting Task Durations" on page 138.